Some movies settle for the minimum. I’m not going to throw out names right now, but plenty of generic horror genre additions come out every year that do just enough entertain and then are immediately forgotten. That’s fine. Sometimes we eat junk food, sometimes we watch dumb movies on auto-pilot. It happens. A Quiet Place, though, is not an example of one of those films. 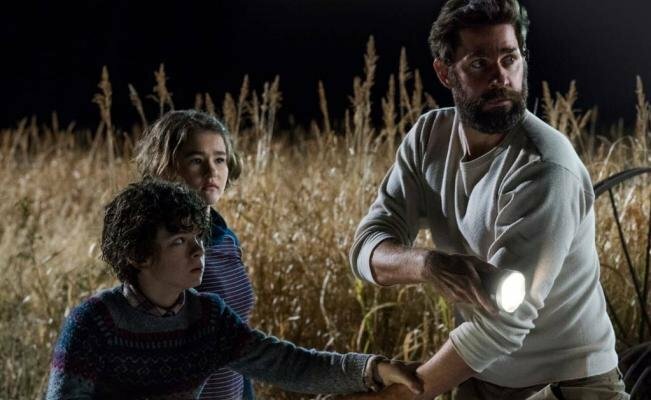 Directed and staring Jim from The Office (John Krasinski) and his wife Emily Blunt, A Quiet Place is incredibly creative, dramatic, and frightening in roughly equal measures. It has wowed reviewers and hushed audiences across the country with its approach to scares reminiscent of a particularly atmospheric Black Mirror episode. I considered reviewing the movie myself, but instead I’ve decided to focus on some of the finer details that went into the movie’s creation to demonstrate just how in-depth it was thought-out. For example, none of the characters are named in the film itself, but all of them were given names which can be seen in the end credits. The father is Lee, the mother is Evelyn, and the son is Marcus. The deaf daughter is named Regan, and she's played by Millicent Simmonds, who is deaf in real life. This decision was made so that she could teach the cast actual ASL sign language so that it was accurate as possible. In addition, each family member was taught to sign slightly differently to match their nonverbal inflections- whereas Lee signs more authoritatively, Regan signs with more attitude. Even though it doesn't actually matter to the plot, Krasinski also came up with a backstory for the movie's aliens to explain their biology and existence on our planet. According to him, they evolved in a world with no light and their armor allowed them to survive the destruction of their homeworld, a chunk of which fell to Earth at some point. This kind of detail was brought into the main movie in its entirety, and also explains why the characters went barefoot- apparently the family thought that having to clean socks constantly would use up too much of their valuable time. Last but not least, if the concept of a weird alien invasion on an alternate Earth sounds familiar in abstract, that's because the film was originally planned as a Cloverfield spinoff. This was abandoned later on, but it's still interesting to note that it almost happened.